BELFAST City Council last night (Tuesday) passed a motion calling for a full public inquiry into Stormont’s ‘cash-for-ash’ scandal. The Renewable Heat Incentive (RHI) scheme, which was set up by First Minister and DUP leader Arlene Foster, is set to run £490m over budget. The motion, proposed by independent councillor Ruth Patterson, was passed by 23 votes in favour to 12 against. 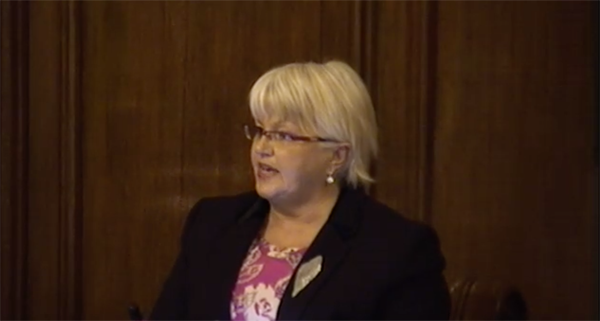 “This Council notes the serious public concern amongst our constituents in relation to financial squander around the Renewable Heat Incentive Scheme,” said Mrs Patterson. “The Council agrees to write to the Secretary of State, as public representatives, highlighting the huge public interest in relation to this matter and, accordingly, requests that he initiates a full public inquiry, pursuant to his discretion contained within Section 1 of the Inquiries Act 2005. Sinn Féin had attempted to amend the motion, calling for an independent investigation led by a judicial figure from outside the north, but their amendment did not attract enough support. Eighteen councillors from Sinn Féin abstained from taking part in the vote. “The public want the truth as quickly as possible,” stated Sinn Féin Councillor Jim McVeigh. The Ulster Unionist Party also proposed an amendment calling for Mrs Foster to resign, but it too failed.